Discover how PrimePOS can help you spend less time on paperwork, accounting, inventory management, sales record keeping and more! Real-time Inventory Management: Electronic Data Interchange (EDI) integration with wholesaler systems to seamlessly automate and manage ordering processes. Using the auto update price feature will keep your item prices current. Sale Pricing: Ability to define sale periods during which items will be reduced to the sale pricing. After the sale period is over, the pricing will go back to its original price. Payments and Returns: Process payments using EMV chip-enabled cards, Apple Pay™ and Android Pay™, and return transactions. Enhanced Customer Service: Manage patient/customer loyalty programs including point accumulation, special pricing or “buy one get one free” offers. Your customized rewards program can be configured in PrimePOS, with benefits automatically awarded to participants. Extensive Reporting Capabilities: On-demand sales tax reports for secure transmission to your accountant. End-of-day reports detail activities accurately across a broad spectrum of departments and categories. Plus a vast library of standard or customized reports are available to give you valuable insight into the purchases being made at your store. Ability to monitor Pseudoephedrine (PSE) sales, including a facilitated process to capture patient driver’s license information. Enhanced security by restricting employee access to certain register functions. Advanced patient signature capture capability. The signature appears on the screen after the patient has finished writing (not during). Cashier then confirms and accepts the signature. and completes the transaction. Compatible with Flex Spending Account (FSA) cards. PrimePOS™, PrimeESC™, and PrimeRx™ seamlessly integrate to provide high-quality customer experiences, including a quick and hassle-free pick-up process. A single-source solution for pharmacy Customer Loyalty Program. Your customized rewards program can be configured in PrimePOS™, with benefits automatically awarded to participants. Ability to review complete patient histories via PrimeRx™. This includes fast access to “prescription picked up/not picked up” records along with accompanying signatures collected through PrimePOS™. Point-of-sale transactions automatically applied to charge accounts maintained in PrimeRx™. In addition, payments received through PrimePOS™ can be applied to PrimeRx™ charge accounts. Ability to print gift receipts for all payment methods. Configure sales periods during which reduced prices will be charged on select products. Prices will automatically revert back at the conclusion of the sale period. Print shelf stickers for every product in your inventory. Set pricing based on your preferences, rather than on wholesaler-defined rates. Apply discounts to over-the-counter (OTC) items without affecting prescription medicines included in the same transaction. Track prescriptions for which copays have been collected, and those that have co-pays outstanding. “Time Sheet” feature allows you to calculate employee hours over a designated period. Electronic Data Interchange (EDI) integration with wholesaler systems to seamlessly automate and manage ordering processes. Ability to identify best-selling products, along with slow movers. Compatibility with devices including hand-held scanners and the Surface Pro 3 tablet to simplify the physical inventory process. 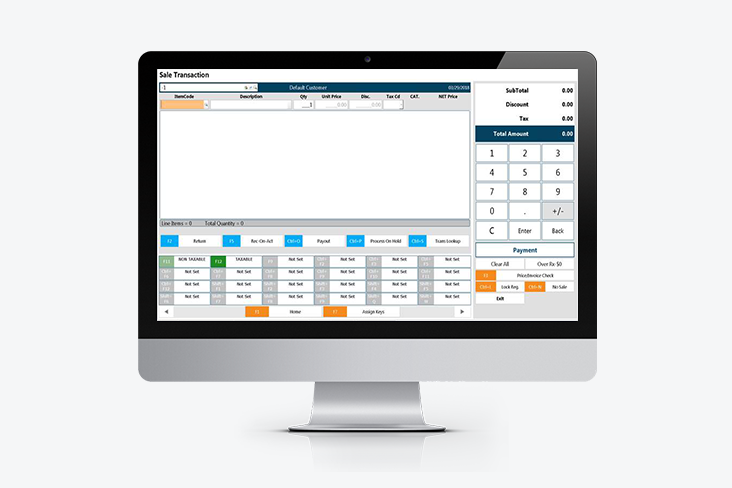 On-demand sales tax reports for easy transmission to your accountant. 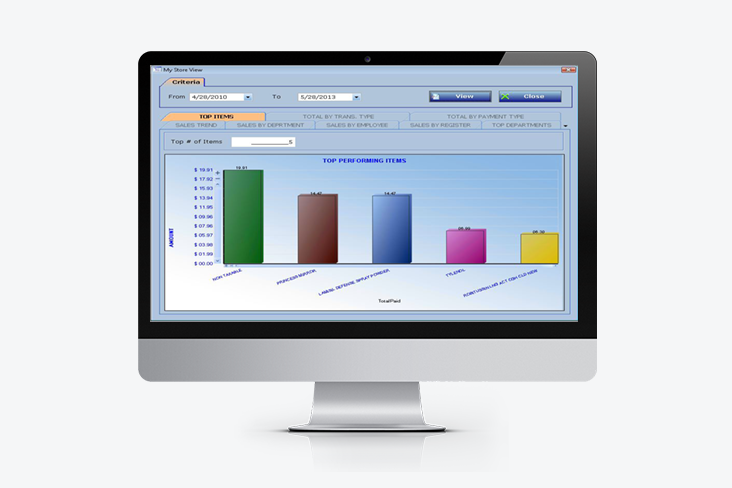 End-of-day reports accurately detail activities across a broad spectrum of departments/categories. Automate your sales tracings for pseudoephedrine compliance reporting through the PrimeRx/PrimePOS interface. PrimePOS encrypted devices are enabled to take all forms of payment (Credit, Debit, and Flexible Spending Account). Without the ability to connect your POS device to your Pharmacy Management System you may miss out on the ability to process FSA transactions, and accept FSA payments. PrimePOS interfaces directly with PrimeRx to make the using your patients FSA accounts seamless to your pharmacy operations and convenient for your customers. Using our PrimePOS with PrimeRx, you can bypass using 3rd party loyalty programs as PrimeRx already has a loyalty program built into the Pharmacy Management System that interfaces with the PrimePOS system to make your loyalty program function as automated as your pharmacy management software with no added costs for external loyalty program management. If you deliver prescriptions to your patients, you can ensure that you are not hit with higher transaction fees through PrimePOS tokenization interface with PrimeRx. Without the ability to tokenize your transactions, your deliveries could be costing you more per transaction as many credit card processors charge a higher non-swipe transaction fee when a card swipe transaction is not used. Through the PrimePOS/PrimeRx interface, you can set up and administer tokenization programs to ensure your delivery charges will be captured at the lower per-swipe transaction rate. Through the PrimeDELIVERY module, your pharmacy can swipe all forms of card payments from a data-enabled pad or phone that communicates the charges and signature directly back into your PrimeRx Pharmacy Management and PrimePOS Point of Sale systems.